After reading my previous Kitchen Tips, how many have you tried so far? Some of these work wonders like Tip 1 here. But instead of spreading Mustard on my burnt finger, I always use toothpaste. When you burn yourself in the kitchen, just spread Mustard on the affected area. Leave it for a while & it will ease the pain & prevent blistering. For aluminum pans that are looking dull, just boil some apple peels in them. This will brighten up the aluminum & make your house smell yummy. 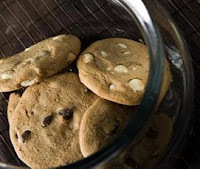 To keep cookies fresh, savvy grannies like to put some crumpled-up tissue paper at the bottom of the cookie jar. If your salt is clumping up, put a few grains of rice in it to absorb excess moisture. To clean fruit stains off of your fingers, rub them with a fresh, peeled potato. White vinegar can also do the trick. Keep iceberg lettuce fresh in the fridge by wrapping it in a clean, dry paper towel & storing lettuce & paper towel in a sealed baggie in the fridge. If your loaf of bread is starting to go stale, just put a piece of fresh celery in the bag & close it back up. For some reason, this restores a fresh taste & texture to the bread. Always keep an aloe vera plant in your kitchen. It’s invaluable when you scrape your arm or burn your finger. Just break off a leaf & rub the gel from the inside on the injury. When making a soup, sauce, or casserole that ends up too fatty or greasy, drop in an ice cube. The ice will attract the fat, which you can then scoop out. To reuse cooking oil without tasting whatever was cooked in the oil previously, cook a ¼ piece of ginger in the oil. It will remove any remaining flavors & odors. In case you've missed my previous Handy Kitchen Tips, here they are: Part I, II & III. Now for the last series: Amazing Kitchen Tips (Part V). Have a wonderful weekend! Thanks for the great tips Shirley :) I too use tooth paste when I burn myself ( I use A LOT of toothpaste LOL)and it works like a charm. Next time I will try mustard since I always have it in my kitchen. I had used tips no. 3, it works wonders. I would love to use tip no. 8, however, plants never survive under my care. LOL! I just heard from a taxi driver - he told me that plants do have headaches too, so he suggested i feed them with some aspirin, he asked me to pound some panadol an mix it with water to water the plant and my plant would survive, wondered how true is this? Shall try the ginger tip - reuse and recycle, hahaha, save the environment. I will try tip 2 since I always store apples in my fridge. Great tips! Loved all these tips, Shirley. I have no problems trying all of them, the problem is remembering to try them. Sigh. I could've used tip #5 a couple days ago after my fingers turned all yellow from peeling and cutting mangoes. Haha. Wow...great tips, Shirley! Never know mustard can help with burns. Thanks very much for sharing. Hope you have a great weekend. Great tips! Interesting that celery slows down bread turning stale.